The Sailboats 101 series of articles — written by Don Launer and illustrated by Ted Tollefson — were introduced in 2003. Some readers asked for a basic overview of technical information and there's no one better at explaining something concisely than Don Launer, a lifetime do-it-yourselfer, sailor, engineer, and tinkerer. Subject matter has varied widely and includes binoculars, bilge pumps, bronze, and brass. This Sailboats 101 collection contains all Don's articles from July 2003 to November 2011. The Sailboats 101 series was never intended to lead anyone through a complete project, to teach him or her everything there is to know on a subject, or to manage an entire installation. As their name suggests, 101 topics offer introductory information on a variety of subjects covered in other ways in our pages. Boatbuilders is a collection of articles published by Good Old Boat about the people and the companies that built our good old sailboats. Building on one design trend after another over the years, each played a significant role in the evolution of the cruising sailboats we treasure today. Based on the example set by the automobile industry, our boatbuilders must have assumed that the sailboats they were building would not last and that design trends would become dated and obsolete. Because fiberglass was so new at the time, they had no idea they were building the classics we would still value today. Boat Designers is a collection of articles about the people who designed our good old sailboats 10, 20, 30, and more decades ago. The individuals profiled here laid a very strong hand on the evolution of our sailboats. At the end of this collection, we added a couple bonus articles. We simply couldn't help adding the profiles of Lin and Larry Pardey and Hal and Margaret Roth. These two cruising couples and the good old boats they sailed over the years have also made a significant contribution to voyaging under sail. This group of 25- to 27-footers is a wonderful collection of capable racers and small-family cruisers. Buying one of these boats is a great way to get started. We hope you'll find this collection of reviews to be informative and helpful. This group of 28- to 30-footers is a wonderful collection of capable racers and small-family cruisers. Buying one of these boats is a great way to get started. We hope you'll find this collection of reviews to be informative and helpful. 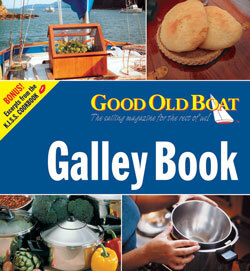 The Good Old Boat Galley Book from our downloads site: AudioSeaStories.com, is about simplifying life in your boat's galley. It isn't about what sailors cook. It's about how they manage to do it in a small space. It's about the basics, as well as tips, tricks, and tools. No oven? No refrigeration? No ice? No problem! From the outset, Good Old Boat has been running articles about life without a cooler, baking bread on a stovetop, and pressure cooking. The volume is further enhanced by a bonus collection of recipes from Corinne Kanter's KISS Cookbook. Additional topics are: drying foods, canning meat, what to do when the salad is gone, harvesting the bounty of the sea (fish and shellfish), making your own yogurt, growing sprouts, how to raise herbs aboard, preserving cheeses on extended voyages, simple bread recipes for small ovens, one-pot meals, solar cooking, conserving water, provisioning, storing and preserving the food you catch or collect, stove fuel alternatives, and the bare necessities.